Accuquilt > GO! Circle - 2", 3", 5"
Using a rotary cutter or scissors to cut out circles is a trick -- you know how hard it is to cut this basic shape accurately. The AccuQuilt GO! Circle die makes it a breeze. 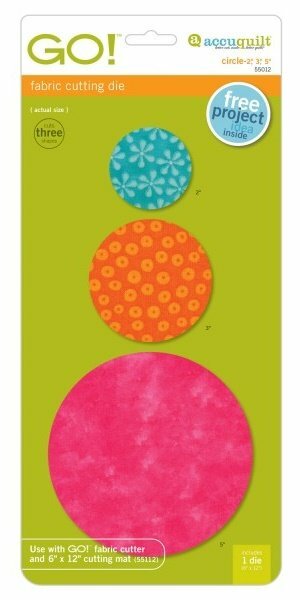 This die cuts three sizes of perfect circles lickety split. Great for popular yo-yo projects and raw edge bull's-eye concentric circle quilt designs. Plus now polka dots, flower centers, large buttons, large eyes and apples and oranges are a snap.